A Child’s health is the moral responsibility of every parent. Common health issues are part of the life of the growing kids as compared to adults. Health problems incorporate various infections in the body and which stops the child’s growth and development. 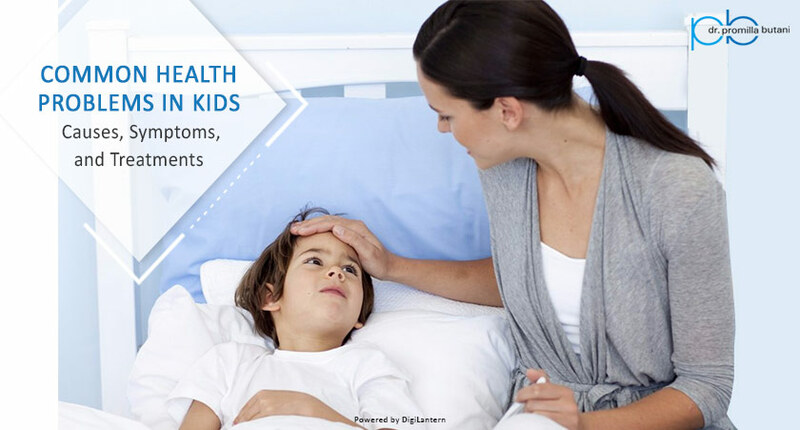 Parents get worried even if their child is suffering from a mild illness such as a cough, cold, allergies, infections, fever, vomiting, and dehydration. Most of them prefer self-medication instead to going to consult a pediatrician. However, doctors don’t appreciate the fact that parents visit them with their kid only once the health issues become severe in nature. Self-medication is not advisable because you might end up consuming wrong medication as you aren’t aware of the actual problem. Many of the chronic diseases start with common symptoms like cold, cough, fever, body pain and skin irritation etc. Going to a doctor during the initial stage helps a great deal to nip the evil in the bud. So, consulting a Pediatrician is no harm because your kid’s health is very important and you definitely can’t deny it. Dr. Promilla Butani, a child pediatrician has thrown some light on common health problems which a child can face. Cold- Cold is a viral infection of nose and throat and it’s very common health issue with symptoms like sore throat, running nose and sneezing. If your child is suffering from fever with a cold there might be chances of having flu or viral. There are few medicines to treat the problem such as cough and cold medicines, antibiotics and zinc supplements. These medications help your child to feel better and they should consume a lot of water and stay hydrated. Cough- A cough is yet another mild illness commonly found in your children. It can be differentiated into two categories i.e. Acute and Chronic Cough. An acute cough is very usual and has common symptoms such as fever, headache, soar throat and nausea. It can be treated with a simple methods like drinking warm water with a pinch of salt in it. A chronic cough is a serious health issue which can be caused by getting in contact with certain chemicals or due to smoker’ cough, and asthma. To deal with these chronic issues parents should keep their children away from smoke and provide them early medications. Diarrhea- Diarrhea is often caused by having three loose or liquid bowels movements each day. It can result in dehydration due to less intake of fluids. If your child is suffering from Diarrhea then avoid giving them fruit juices and soft drinks as these can worsen the disease. A severe stomach pain, vomiting, and diarrhea at the same time are all considered to be the symptoms of it. Intake of lots of fluids is the foremost treatment for Diarrhea. Fever- Is your child having a high temperature? He or she might be suffering from fever. Children suffer from fever due to various reasons such as a cough, cold, extreme sunburn and bacterial infections. If your kid is suffering from high temperature it’s important for them to drink lot of water, consume a healthy diet and intake proper medication to lower down the temperature. Chickenpox- Are there any itchy red blisters on your child’s body? He or she might be suffering from chickenpox. It is a contagious disease that can be caused to the person who comes under the contact of a person suffering from this disease. The best way to avoid chickenpox is to keep your kid immune. Immunization is an effective way for treating chickenpox. So, keep your children away from these common health problems by providing a healthy diet and good environment. Let them experience a life full of adventure and fun activities because good health is the life’s greatest blessing. For more information regarding illness or health issues in kids, you can contact Dr. Promilla Butani or can leave your query at info@drpromillabutani.com. Next Next post: Safety is as simple as ABC – Always Be Careful!